Now that we have all had our fun taking part in the #Guccichallenge or using photoshop to envision how our favorite celebrities would look in super-oversized Balenciaga coats, the dust has settled on the events of Paris Fashion Week 2018. Though there was a lot to take in, my personal top picks for this year’s most noteworthy runway outings go out to brands who took a nuanced approach to shaping the future of their labels. Let us take a lot at some of the most exciting highlights from Paris Fashion Week 2018. Chloe came on strong with a refreshed approach to tailoring at Paris Fashion Week 2018. While Natacha Ramsay-Levi’s stint as Chloe’s creative director is still in its honeymoon phase, her wealth of prior industry experience is breathing new life into the maison. Trading in the label’s once-requisite flou silhouettes in favor of sharp tailoring, Paris Fashion Week 2018 saw the brand blending the textural cornerstones of 70’s excess with shapes that nod to the campy futurism of Nicolas Ghesquière-helmed Balenciaga (understandable bearing in mind that Ramsay-Levi’s had a former gig working under the designer). Yet the strength of the collection transcends its glaring reference points, crossbreeding retrograde ideas of modernity and luxury to foster something undeniably refreshing. Loewe truly outdid themselves with their streamlined collection for Paris Fashion Week 2018. J.W. Anderson’s promise of delivering a more grounded version of the typically otherworldly Loewe girl has manifested itself in a focussed, approachable collection that showcases an unexpected but welcome turn towards functionality. Though past collections have taken Anderson’s appetite for innovation to sensory-overload extremes, a consolidated version of the urban-chic otherness the label has been inching towards has come to light. In a show soundtracked by the soothing mantras of a self-help guru, Anderson’s focus on mindfulness is knowingly laced in contradiction with its not-so-subtle emphasis on subtlety itself. The blend of flawless casting and conceptual intricacy made Jacquemus’ latest collection, ‘le souk’ a big hit at Paris fashion week 2018. The Jacquemus label continues to both mature and expand, with the unexpected revelation of an upcoming menswear line appeasing those curious about the designer’s cryptic #newjob posts. Yet the label’s womenswear offerings at Paris Fashion Week 2018 were equally headline-worthy, with their muse morphing from the surrealist gamine to the aloof holidayer lingering in the ‘souks’ of Morocco, after which the collection is named. Considering that Jacquemus aims to drop us in the midst of Morroco’s dense, chaotic outdoor markets, the collection boasts a surprisingly streamlined vision, gesturing towards the designer’s ability to reinterpret its source of inspiration rather than directly translate it to the runway. 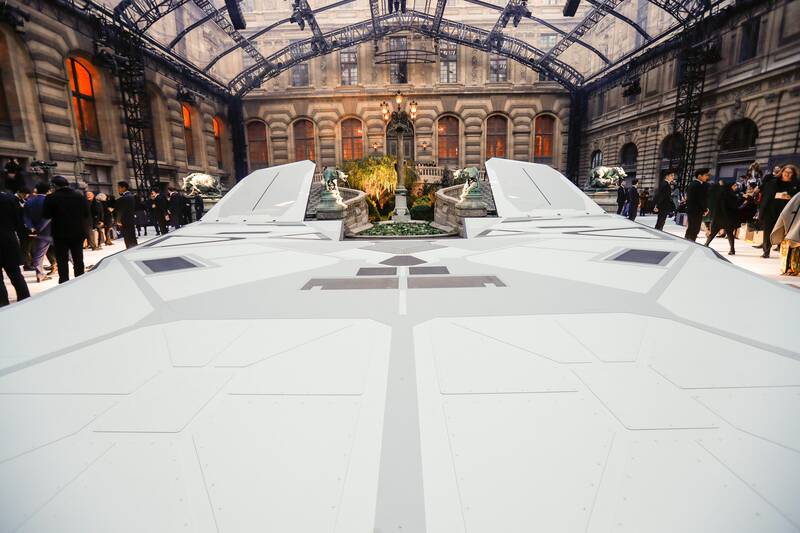 The retro-futuristic set of Louis Vuitton’s latest collection was on par with its time-warping designs. Louis Vuitton’s offerings for Paris fashion week 2018 appear to have been wrested from a parallel universe, proposing a delightfully skewed version of the 1950’s if it were lost in inter-dimensional translation. The collection’s prominent tweed skirt-suits, double-breasted blazers, fitted cardigans and bespoke pumps all point towards the touchstones of retro office-wear, yet with Ghesquière’s unmistakable silhouettes in tow, an air of futurism is cast over the entirety of the collection. Fashion’s top events often thrive on unexpected risk-taking, and Paris Fashion Week 2018 was no exception. With many labels subtly reinventing themselves, we can only sit back and see which elements of these groundbreaking collections will take part in defining 2018 fashion.